You know how parties work. You schedule a gathering for, say 7. Things get rolling at 9. By 11, you’re exhausted and you can’t wait to get everyone out the door. That’s about the time the last trickle of guests shows up. They bring friends you’ve never met and maybe a bottle of something strong. They plant themselves on the sofa and somehow this becomes the best part of the evening. You realize that all the work, the housecleaning, the expensive booze, the finger food, was worth it. 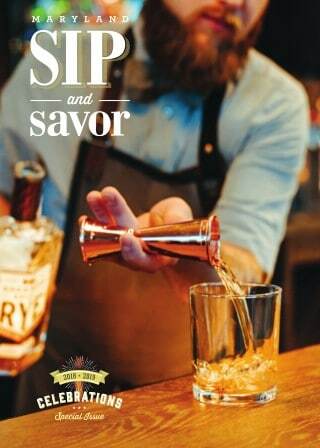 I’m not comparing our Celebrations issue of Maryland Sip and Savor to last-minute party guests. But it was an unexpected surprise. After the flurry of our initial launch last spring, we decided to add a third issue in 2018. We didn’t want to lose the momentum. And, well, so much happens between November and March. The Maryland Distillers Guild recently declared November Spirits Month. February has been deemed FeBREWary by the state’s brewers, and we’ve long enjoyed sampling the latest offerings from Maryland wineries at the Winter Wine event in January. Add the December holidays, ringing in the new year, and my personal whisky-tippling favorite, Robert Burns’ birthday on January 25, and you’ve got plenty of reasons to raise a glass in the otherwise dark months. Oh, and St. Patrick’s Day. We mustn’t forget that annual travesty of tinted ale. Plus March is wine month, in case you didn’t know. There’s more to celebrating in Maryland than just raising a glass. In the winter months, we get outdoors, snuggle up inside, eat in, eat out, make resolutions and hanker for spring. In preparing this issue, we had fun seeking out Maryland makers who can help with all that. This special edition of Maryland Sip and Savor is meant to keep the party going. Stay tuned for new posts each month as we work our way through the fall and winter celebrating all that Maryland has to offer!